R.W. Knudsen Family Just Cranberry Juice, 32 Fl. Oz. R.W. Knudsen Family Just Cranberry Juice. Premium Cranberry Juice100% premium cranberry juice from concentrate Product FeaturesUnsweetened70 calories per 8 fl ozContains 100% juiceMade with the finestAll-natural ingredientsNo preservatives and no artificial flavorsFor goodness sake!®Each 8 fl Oz Cup Provides a 1 Cup Serving of Fruit**Serving information based on USDA's MyPlate (www.ChooseMyPlate.gov)Knudsen & Sons, Inc.,P.O. Box 369,Chico,CA 95927,USA.www.rwknudsenfamily.comNon-GMO Project Verified is a Registered Trademark of the Non-GMO project, Inc. Ingredients: Filtered Water (Sufficient To Reconstitute), Cranberry Juice Concentrate. Instructions: Natural separation may occur. Shake before serving. This product is real 100% Cranberry Juice. 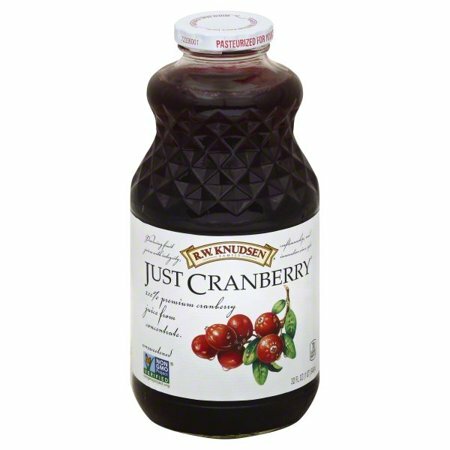 Some products mislead with labels stating "100% Juice Cranberry" while it is a blend of various juices. This is the real deal. I did purchase this item at Walmart and was pleased with the price. I did have to order 9 bottles to get the free shipping but this juice is $10 at some other grocery stores. Very pleased. Because there's nothing in it except cranberry. No added sugars or other fruit juices. No extra sugar or added ingredient. Healthiest choice!